By “Koach Karl” Dewazien, author and producer of soccer resources for all youth levels. The best preparation for learning to play soccer and keeping them playing is being under the tutelage of a loving coach/teacher at the very beginning. Experienced coaches know that it takes between 7-10 years for most children to have had enough familiarity with playing the game to be able to put it all together and actually master soccer. When we expose beginning players to an adult soccer environment, including over-organized practices with laps/lines/lectures, practices consisting of drills with no ‘theme’, competitive games for league standings and winner take-all tournaments, then we rob them of the inherent joy and purpose that comes from learning to play masterful soccer. One of the biggest problems we face in soccer is that we are trying desperately to teach technique and tactics which are out of alignment with natural development. Experienced coaches know this but our soccer culture forces coaching that is inappropriate for young players. We would never tolerate trying to teach children to walk at 3 months because it is impossible. Yet, we attempt to teach tactics before technique is mastered. Development requires that players have more time as proven by international soccer stars. These super-stars reached the highest level of play, in their youth, through playing informal pick-up games which we seldom see played in our country. Therein lies one answer to prevent the quitting phenomenon … I truly believe that we must first TEACH and then ENCOURAGE the young players how to play soccer on their own without adult supervision. Teach by having the players lay-out their own playing environment in every practice. There is no reason for coaches to continuously lay-down & pick-up cones which results in players becoming dependent. Yes, young players are able to lift and carry cones. They are also able to learn how to step-off distances required for small goals, grid or field sizes. Home-work = Juggle Ball 10 minutes every day! Goal – Beat personal Juggling Record at the next practice. Home-play = Play 1 vs. 1 game 10 minutes every day! Goal – Show improvement of a Specific Dribbling-Move. If you are able to teach and they are able to learn how to play “Horse”; “Around the World”; “21”; “1 vs.1” and “Pick-up Games” in Basketball, then surely you can teach them and they can learn how to “Juggle”, play “1 vs. 1” and “Pick-up Games” in Soccer. When players are allowed to be involved in their own learning process and become independent, they learn more easily. Learned players then become competent and competent players usually end-up loving what they do. And we have found that rarely does anyone quit something they Love to Do. 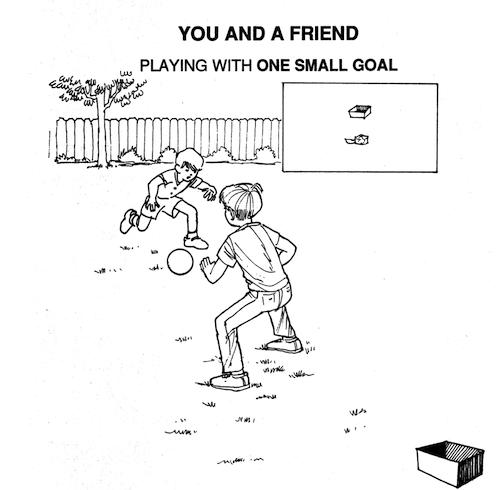 Illustrations are from Koach Karl’s Coloring Book, “TOTALLY – FUNdamental Soccer”. Koach Karl (Karl Dewazien) is the former State Director of Coaching for the California Youth Soccer Association (CYSA), Author of the Internationally Published FUNdamental SOCCER Books Series, Producer of the highly acclaimed ‘9-Step Practice Routine’ DVD. He can be reached at: [email protected] or www.karldewazien.com.